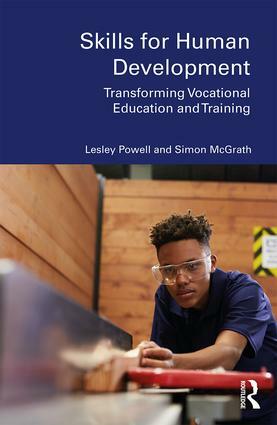 This blog was written by Simon McGrath and Lesley Joy Powell, authors of the new book, ‘Skills for Human Development: Transforming Vocational Education and Training’, published by Routledge. Simon McGrath is UNESCO Chair in International Education and Development at the University of Nottingham and Extraordinary Professor at the University of the Western Cape, South Africa, and Lesley Powell is Research Chair: Youth Unemployment, Employability and Empowerment at the Nelson Mandela University, South Africa, and Honorary Assistant Professor: School of Education, University of Nottingham. Vocational education and training (VET) matters. It can make a genuine and profound difference in the lives of young people, particularly from marginalised backgrounds and/or with less successful educational trajectories. However, it is not simply for those who can’t ‘do any better’ than this, who are ‘second chance learners’. VET is for learners of all abilities, life stories and aspirations. An important part of VET’s ability to make a difference in peoples’ lives does come from its conventional role of preparing them for the labour market. However, again, this is an over-simplistic account. VET is not about narrow employability but also about the preparation of young adults to become mature adults within occupations, communities and broader society. Moreover, VET is not just about preparing people for work, but is important to their broader projects of human flourishing. We need a new theoretical and practical account of how VET makes these contributions. We suggest that a particularly fruitful direction to look for a new theory of VET and development lies in a combination of the capability approach and Margaret Archer’s approach to structure and agency. Together, they allow for a rich understanding of the complex interactions of structure and agency, and suggest an approach for theoretically understanding the agential actions and choices of students. Together, they also offer a new and robust approach to evaluation that focuses both on actors’ priorities and on uncovering causal mechanisms. Together, they have a theoretical, ethical and methodological concern to engage with the voices of learners and to put their experiences, perspectives and wellbeing at the centre of our debate about VET theory, policy and practice. This allows us to bring social justice to the forefront of the discussion of VET’s purpose at the national, institutional and individual levels. Drawing on conversations with young South Africans, we insist that VET should be about enlarging peoples’ opportunities to live a flourishing life, rather than simply being about narrow employability and productivity. We argue that human development approaches, by acknowledging the importance of work in its broadest sense, offer a better way of bringing together VET and development than the current human capital-inspired orthodoxy. This requires us to think about what counts as success for vocational providers in a different way. Rather than emphasise pass, throughput or employment rates, important though these are, our approach calls for evaluation to focus primarily on the extent and ways in which institutions, and the system, support the flourishing of learners. This envisioning of a new evaluative stance can play an important role in imagining and building a transformed VET.